The first time I ate a version of this very old Venetian meal was at a very popular restaurant in my neighborhood in Brooklyn called Al Di La. The restaurant serves simple Italian food at it’s best and this is precisely why it is so popular. 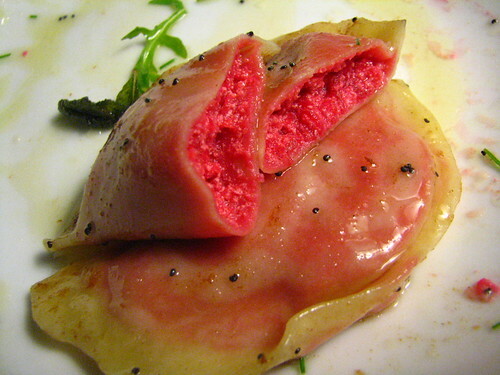 But since that dinner, a few years ago, I still have a vivid memory of their beet ravioli. Casunziei is actually the name of a shape of ravioli made into a half-moon and crimped along the edges. Not only is this type of pasta filled with beets, it can also be filled with pumpkin or red radicchio. This ravioli is another traditional Italian dish made originally from “products that the land offered”. The oldest recipes are of two varieties: Red Casunziei and Green Casunziei. The red was made traditionally for the fall time and was filled with red beets, potato and yellow turnip. The Green Casunziei was made with spinach and wild chives grown in the spring. Don’t you just love the seasonality of it? When researching this dish, it seems that there are a few ways to cook it – some add carrots and/or turnips to the filling, others add potato and/or ricotta. Some sprinkle with smoked mozzarella, mint or chives. I took, as always, the best of the traditional ingredients and what resulted was a beautiful and eye-popping meal. I decided to add ricotta and one potato to my filling to offset a bit of the sweetness beets can have. Not that I didn’t want to taste the beets, I just wanted to mellow a bit of the taste. But believe me, it didn’t take away from the flavor. If you have a food processor, this dish will be much easier and less messy to make. Beets stain, kids. Like a mutha. I looked like I feel into a red paint-can hands-first by the time I was done with making this. But, it was worth it and the results were stunning and oh-so-tasty. Also, forgetting the brown butter sauce, it is super healthy! Get that ‘wow-factor’ from your friends and make this dish! 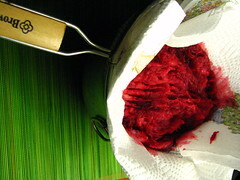 Boil your beets and potato until very soft. Remove and allow to cool for a bit. When cool, mash by hand or blitz in a food processor till pretty smooth. Add to a bowl. 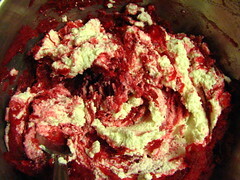 Once the beet/potato mixture is cool, add your ricotta, cheese, nutmeg, salt and milk. Stir to combine. Taste for seasoning. Using a glass or ravioli cutter with a 4-inch diameter, cut your ravioli circles. Fill the midde of each ravioli with about 1 teaspoon filling. Wet the outer diameter of the ravioli with water using your finger. Bring one side of the circle to meet the other and pinch all of the sides closed. Dust with a bit of flour and allow to await its fate in the boiling water. Note to self – start boiling your pasta water. Don’t forget to add some salt! Continue making all your ravioli until you have enough. Add your ravioli to the boiling water and allow to cook (about 2 to 3 minutes). They should raise to the top when they are done. In a separate pan, heat up your butter on medium-low and allow to cook until butter begins to get a bit of color. Add your sage leaves and continue to get a bit more color. Add your poppy seeds and toss a bit. Add your ravioli’s to the pan and toss in the butter sauce. Plate ravioli’s with some of the butter sauce on top along with a pinch of (optional) salt and a dusting of freshly ground parmigiano reggiano and chives (optional). Wow, those look amazing. The colour is great. I will a go at these when I finally get a pasta machine. I love how this presents. Since its seasonal can you use Golden Beets as well? I just love beets and this not only an amazing photo but it sounds so dang good! It’s like art-work! Dude those look awesome. Between the beets and the shape of the dumplings, I automatically thought about pierogi. Beets are a staple in Polish cuisine, and my family has always grown up on them. Amy, those look absolutely wondeful! WOW! I just got into making my own pasta. Stay tuned for lobster ravioli! Thank you guys! I’m not bragging, but seriously, these photos made me crazy when I saw them. It’s like trying to photograph a model, you don’t really need that much skill – the model is what makes the pictures. These ravioli were great to work with because of all the colors. coco: I think that using golden beets sounds great! in fact, maybe it would be cool to make the ravioli’s with beet juice and and then stuff them with the golden beets for the color variation. play around!! serena, np and adam: THANKS!!!! This. This is perhaps the most lovely vision I have seen in some time. That fuchsia is one of the sexiest colors known to man. Simply pulchritudinous. This is a really intriguing dish you’ve put together and the photos are beautiful. That color really leaps off the plate. Its been a long time sine I’ve made ravioli–and now you’ve got me thinking its been too long! Really nice work! Wow. Just wow. I may have to stick with calling this shape perogi pasta instead of Casunziei. This would be a very impressive meal to serve to guests. I would imagine quite time consuming, but definitely stunning. Great job! You guys do such a good job of trying different recipes and explaining the history/details surrounding the dish. I like the poppy seeds! Very pretty. Beet ravioli sounds great! What an amazing colour! 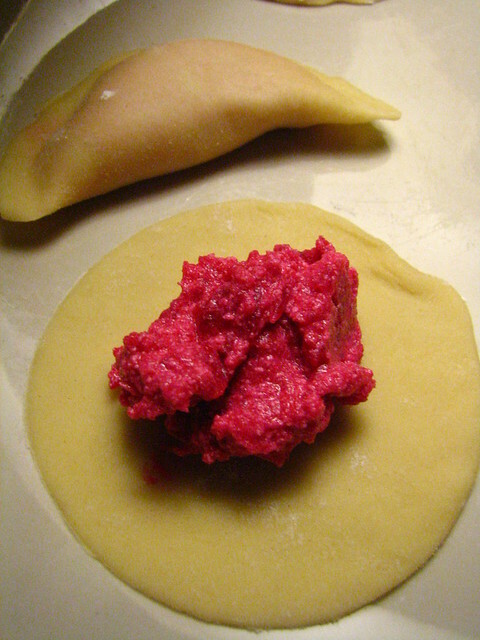 I love beet and ricotta ravioli. I think they might just be one of my favorite things to eat, if anything for the color alone. I love that you’ve sprinkled yours with poppy seeds, they look so pretty. That is one gorgeous looking meal! So yummy with the brown butter all over it, its worth the red hands!! This looks SO delicious. I love the visual impact of the poppy seeds. I’ ve never been to Al Di La, but it’s on my to-do-list, as are these ravioli. superbe! 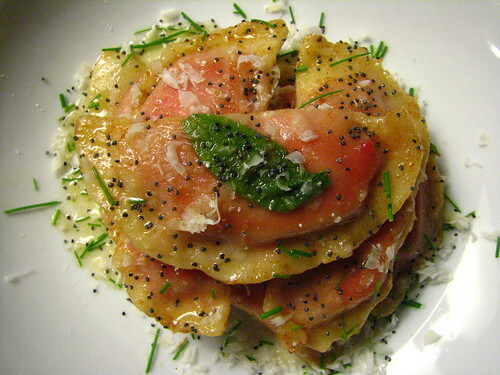 my husband has a serious beet obsession and love to make ravioli…we will make these. How completely beautiful your ravioli are! This looks so good. Reminds me of something called Khingal we make in Azerbaijan. The same shape. Stuffed with ground beef or lamb or cheese. yum! Should I say Dio Mio here? Dios Mío, My God!!! YOu are getting better and better… stunning pictures and wonderful pasta dish. Qué rico guys!!! Those look amazing! Love colors in cooking. I was having trouble getting to your site for a while…. not sure why but it was taking a long time to upload. Glad it’s working now. Your pictures rock! Wow, how gorgeous are those ravioli’s. Stuffed with beets and potatoes. YUMMY!!! oh these look wonderful! i love the pinkness of their insides. yum. Thanks for sharing this recipe! I am in love with it! I am going to prepare it as soon as I can. It beautiful and tempting! I’ve wanted to make this since you posted it, and finally did today as part of the One Local Summer challenge. No, I’m not in Italy…but luckily I didn’t have to be since we have all the fixings here in Eastern Washington too. 🙂 Thanks for the recipe, and your photos are awesome. Thanks for the recepy. I’m really sorry for using the photo without asking for your permission and not giving you credit. It’s taken care of now. Fantastic blog btw and really great photos. Thanks for posting the recipe, it looks great! And hi, we must be neighbors. ^^ I live a few blocks from Al Di La. Absolutely gorgeous. But why not up the ante a little and roast the beets and potato? The broiler adds an obscene amount of flavor with relatively little hassle, and would not only server to further mellow the flavor of the beets (while amplifying the nutty caramel flavors), but to make the potato pop like a fat man in a leotard. Thanks IanEff. I agree… it still is one of the most beautiful things we’ve cooked. I agree that roasting the veggies could be wonderful – give it a try and holler back. Maybe we’ll try it next time too. The reason I may not roast would be that it would change the color a bit. One of the most striking things about this dish is the bright color and roasting would just mute it just a bit. BUT, you are so right about the flavor change – could be a winner! Can’t wait for you (or I) to give it a try! Thanks for the excellent comment/suggestion. i love raviolis! i eat them almost everyday for lunch! thanks for all your suggestinos and tips! u make them look so goof in the pictures above! Thanks for the recipe. We had these recently in the Italian Alps (near Cortina) where these are something of a local speciality – they’re featured in most of the local restaurants along with speck and buckweat polenta. I’ll be trying your recipe this weekend. I had these in a restuarant in Manhattan back in July. I think it had not been opend very long when I ate there. Everything I had was delicious. ← Morcilla-Stuffed Squid – Bloody Hell!